The oldest home in New Madrid, the Hart-Stepp House was built by Abraham Augustine in 1840 and moved to its present location in order to escape the encroaching waters of the Mississippi River. It is now home to the River Walk Gallery and the New Madrid Chamber of Commerce. The Gallery features the works of local photographer and artists. Savannah is the largest town on the Tennessee, discovered in the 1820’s and incorporated in 1833. The most common association with this historical town comes with its ties to the Battle of Shiloh – a major Civil War Battle also known as the Battle of Pittsburg Landing, fought on April 6th 1862. Spend the day exploring the stories and history associated with the city of Savannah and its deep Civil War ties then explore the city’s many trails and paths winding down the lush banks of the Tennessee River and admire the beautiful sights! Enjoy a day in the Tennessee sunshine in this 44 acre park overlooking the Tennessee River. Relax in front of the water at any of the pavilions or benches, take a brisk walk on the paved walking trails wrapping around the banks of the river. This museum, founded in 1992 is located in an old post office building in downtown Savannah that was constructed in 1939. The building is listed on the National Register of Historic Places. Inside, exhibits and collections are dedicated to preserving the history of the Tennessee River Valley so that future generations have an accurate depiction of their heritage and history. The museum features seven permanent exhibits such as “Paleontology,” filled with more than 200 fossils, “Archeology,” comprised of antique pottery and tools, “Pioneers,” exploring the Chickasaw Treaties, “Trail of Tears,” portraying the historical Native American travels to Oregon, “War on the River,” explaining the battles of Union invasions, “The Golden Age of Steamboats,” highlighting the historic Tennessee Riverboat trade, and “Musseling,” featuring the story of the historic pearl button industry. This two mile stretch passes 42 historic homes which accurately portraying the architectural styles across Savannah’s history. Many of the homes are privately owned so are not open to tour, but are just as beautiful on the outside as they are on the interior. Featured homes include U.S. Grant’s Headquarters, the Churchwell-MicGinley-Taylor House, a former women’s college from the 19th century, and Irwinwood which was named after the owner who was credited for acquiring the land for Shiloh National Military Park in the 1890’s. This beautiful mansion was the headquarters for U.S. Grant during the Battle of Shiloh. Hear the stories of Grant during his time within the property and hear about some of the Battle of Shiloh history. Admire the unique fireplaces, desks where Grant would sit to construct plans of battle, hand-made stone fences surrounding the property, and views of the Tennessee River off of the back porch. 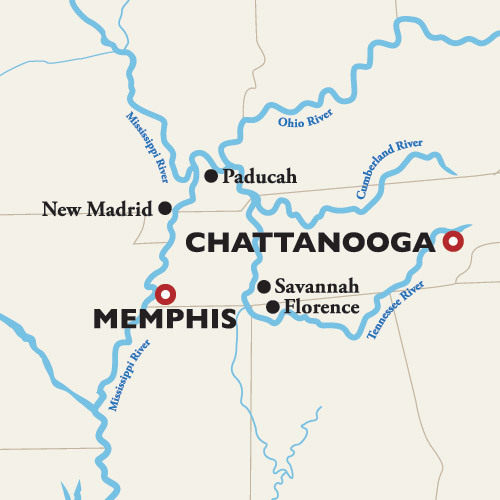 THE ENDURING LEGACY OF THE CIVIL WAR - The Mississippi River, and its tributaries, was of great strategic value as both a transportation and communication route during the Civil War. Experience authentic Southern culture as you journey through living history and explore the legacy of the Civil War both onboard and in ports of call. Distinguished guest speakers will be onboard to captivate you with astounding Civil War presentations.